A new project is about to start. A freeform cardigan for my granddaughter Fenna. She's 3 years old, and a very girly girl, crazy about pink. The materials i'm going to use are Lang Cotone, Lang Street, Lang Tonga, Rowan Pima Cotton DK, Gedifra Possible, Online Corsofino and Online Linie 258 Tequila. All pink of course, and various materials. 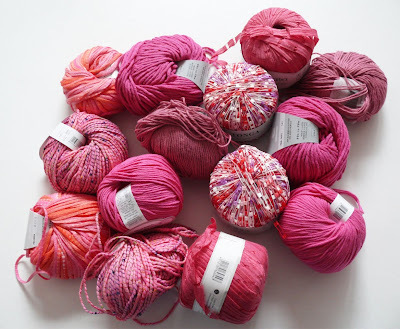 I'm very curieus about the ribbon yarn, because i have never used that before. Great choice for a little girl. Ribbon yarns are like a little touch of sun in the knitted work. I love them.